Do you cross the street to avoid the graveyard? Does a viral outbreak make you bolt the door? How about street drugs that turn abusers into cannibals, fungi that change insects into mindless biting machines, or people who swear they've spotted their dead loved ones labouring in the fields? Then maybe you should drop this book and look for a hiding place. NOW. A survey of folkloric and fictional zombies by origin, type, and dramatic role. The living: screaming survivors, officials who won't believe their eyes until their faces are ripped off, born zombie-killers, and sinister zombie-masters. Extensive guidelines for building customized zombies to surprise your players. Ready-to-go examples, from B-movie ghouls, through necromantic undead, to still-living infected - and beyond, to mad-science monsters created by surgery, nanotech, or memetics. Rules for simple horde combat, fleeing for dear life, avoiding infection, curing zombies... and creating them. Advice of using zombies in any genre - not just horror. 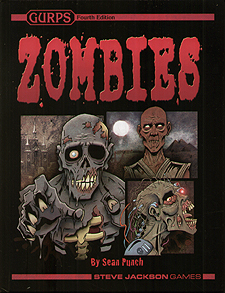 GURPS Zombies requires the GURPS Basic Set, Fourth Edition.